While he drops hints about his intentions for 2016, Jeb Bush the former Governor of Florida is in South Carolina only weeks away from a deadline that was self imposed about whether he would be running for president. 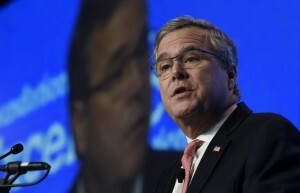 Bush will give the commencement address Monday at the University of South Carolina. This is the second visit Bush has made to South Carolina in the past three months. South Carolina will host the first contest across the South in the presidential primaries of 2016. In an interview on television that aired the night before his appearance in South Carolina, Bush expressed that he would make a good president, adding the he also was now writing an e-book that is about the time he spent as Florida’s governor that would be available in spring. Bush also said he was going to make public close to 250,000 emails from the time he was in office as a way to promote more transparency and to allow people to make their own minds up. Bush said that going through all the material reminded him that if you have big ideas, are true to them and get an opportunity to implement them with conviction and passion you can help move the needle and that is what America needs now. Aides have said that Bush is not planning to meet with any political operatives during his time in South Carolina. In addition, his speech on Monday is not expected to contain political tones. However, his presence in a southern state high on the primary calendar for the presidency will add new speculation that he is heading toward a bid to enter the White House. As son of one U.S. president and brother to another, Bush can easily transform the contest in 2016 like no other member of the Republican Party. He is able to tap into the vast political network of his family and a Bush campaign would attract huge support from major political donors and receive enormous quantities of media attention. However, his supporters have struggled to understand what the action’s of Bush mean and whether his political intentions can be predicted.